At a community meeting on the Sepulveda Transit Corridor held in Van Nuys on Saturday, February 2, 2019 the crowd of 120 who braved the pouring rain, listened carefully to the analysis of potential ridership and transit alignments presented by Metro and asked questions about whether the planned service and parking would be sufficient, and about safety, stops, and more. 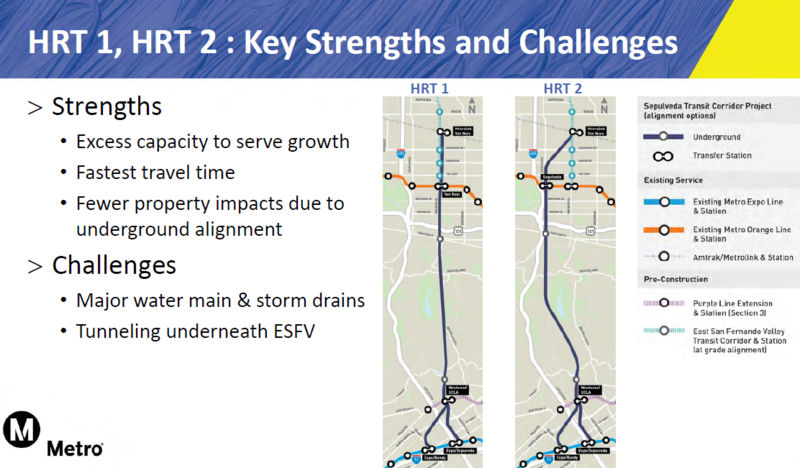 The presentation started with an explanation of the history of the project, indicating that Measure R in 2008 provided $1 billion for the I 405 corridor with an opening year of 2039 and Measure M in 2016 provided $5.7 billion for Valley-Westside transit with the equally distant opening year of 2033. The good news is that we might actually see progress in our lifetimes with the incentive to accelerate the project in time for the 2028 Olympics using a public-private construction partnership. Project purpose and need is to provide a high-quality transit service that effectively serves a large and growing travel market between the San Fernando Valley and the Westside, including the LAX area. For transit to be a competitive travel option that attracts new riders, there is a need to increase the speed, frequency, capacity and reliability of transit service and provide convenient connections to existing and planned transit corridors. Light Rail, usually above ground, includes 3 rail cars at a time. Light rail is used on the Expo and Gold lines. Lower capacity than Heavy Rail. Monorail / rubber tire. Monorail would be similar to the Disneyland concept. Rubber tire is a transit vehicle on rails which also incorporates rubber tires, allowing for greater traction and the ability to go uphill. Used in Montreal; not currently used by Metro. This option allows for going over the Sepulveda Pass, rather than under it. Not having to tunnel could be cheaper and faster to build. But it also moves more slowly, especially since it has to climb the hill. Metro noted that the East San Fernando Valley Transit Corridor (ESFV) was approved by the Metro Board June 2018 using light rail between the Sylmar Metrolink Station and the Van Nuys Orange Line Station. The ESFV rail is planned to connect with the Sepulveda line at some point, possibly at the Orange Line, where riders can transfer. 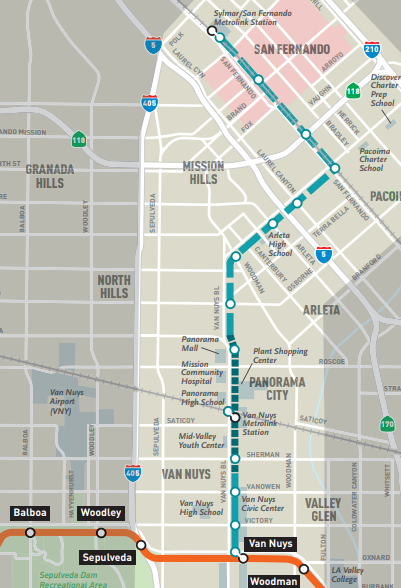 The ESFV is envisioned as a local service, whereas the Sepulveda line is envisioned as a regional service. 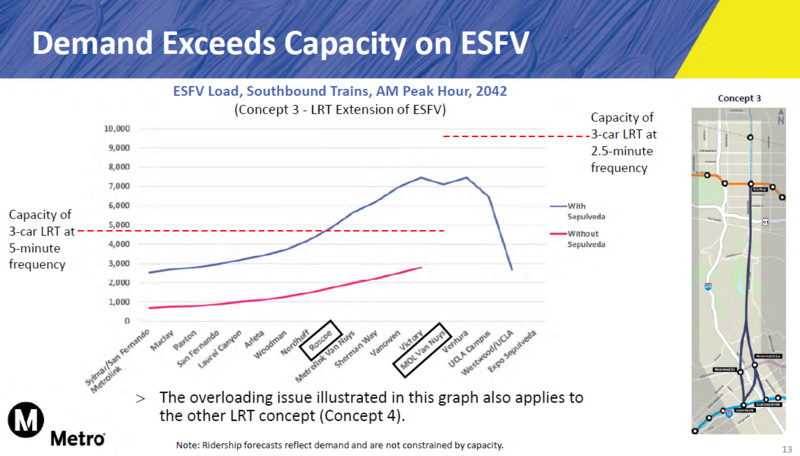 As Metro evaluated potential ridership headed south, they came to what sounded like a surprising conclusion, which is that the demand for southbound service starting at Roscoe and continuing to UCLA, exceeded the capacity of light rail at 5 minute frequency. Capacity is shown on the chart above by the lower dashed red line. Demand is the blue line jutting above it. In theory, if light rail were increased to 2.5 minute intervals, they could meet the demand, as shown by the upper dashed red line. However, the logistics of sending light rail every 2.5 minutes on a track that intersects with car traffic is problematic and unrealistic. 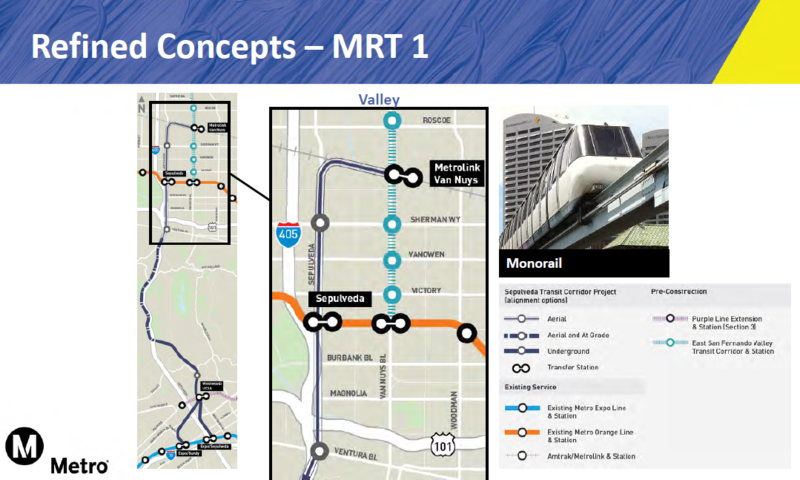 Based on this analysis Metro changed their plan and now is considering starting the Sepulveda line at the Van Nuys Metrolink Station north of Sherman Way, rather than at the Orange line. While the need for transit from the north valley over the hill seemed a surprise to Metro, attendees were not surprised. When questions came up inquiring about how to address ridership needs with more frequent service or why they would start at Sherman Way when demand was already above capacity at Roscoe, the crowd signaled their concern applauding. To the question about moving the project further north in conjunction with the East Valley Transit Corridor, planned to run as light rail down Van Nuys Blvd, the answer was that the East Valley Transit Corridor project is already approved and we can’t change it. And it is intended as a local line, not a regional line. On the topic of parking, Metro suggested that people would take other lines such as the Orange Line and the ESFV line and transfer to the Sepulveda line. Upon probing further, it was revealed that Metro has not planned any additional parking at ESFV stops to accommodate riders doing that very thing. Riders from Granada Hills, North Hills, Mission Hills would not find additional parking spaces to be able to use the ESFV to get to the Sepulveda. Participants expressed concern about parking at all access points in the Valley including how to access the line from the 405/101 interchange. 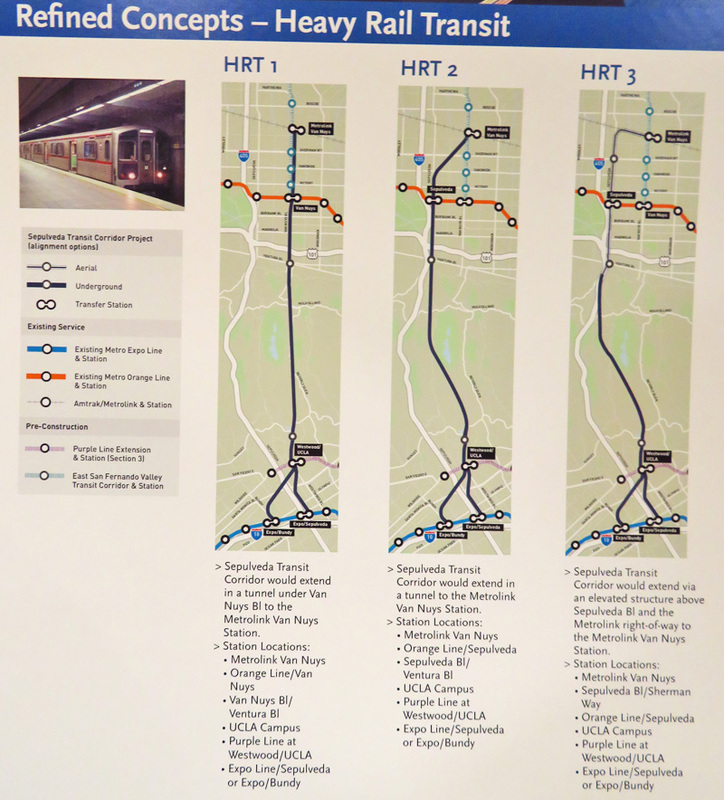 Heavy Rail options 1 & 2 would operate in a tunnel under the pass. HRT 1 overlaps or rather underlaps with the ESFV light rail light on Van Nuys Blvd. HRT aligns more closely with Sepulveda. At the south end the line intersects with the Purple line extension to UCLA and then the Expo line at either Bundy or Sepulveda. Daily ridership is estimated at 123,000 for HRT1 with travel time of 15 minutes between metrolink in the Valley to Expo line over the hill. Daily ridership is estimated at 120,000 for HRT2 with travel time of 16 minutes between metrolink in the Valley to Expo line over the hill. 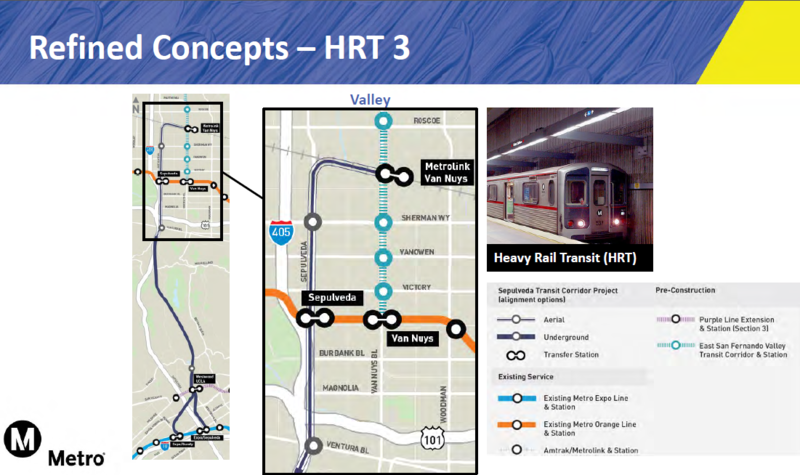 HRT3 would tunnel under the pass, but be elevated from Ventura northward along Sepulveda and then use the Metrolink track to the Van Nuys Metrolink Station. Daily ridership is estimated at 133,000 for HRT3 with travel time of 18 minutes between metrolink in the Valley to Expo line over the hill. MRT1, the monorail/rubber tire concept would travel above ground on the west side of the 405, immediately adjacent to the 405, passing underneath the highest bridge. At about Getty Center Drive, it was cross over to the east side of the freeway. Daily ridership is estimated at 105,000 for MRT1 with travel time of 26 minutes between metrolink in the Valley to Expo line over the hill. Ultimately the plan is to continue the line south to LAX. Metro is gathering public comment, further refining their options and evaluating costs. This entry was posted in Metro LA on February 4, 2019 by Editor.